Manufacturer Refurbished. The device is manufacturer certified to look and work like Brand New with a 1-year manufacturers warranty. NEW – Kindle Voyage can be read in sunlight or total darkness—and it's smart enough to know the difference. Kindle Voyage E-reader 6" High-Resolution Display Adaptive Built-in LightPagePress Sensors Wifi. 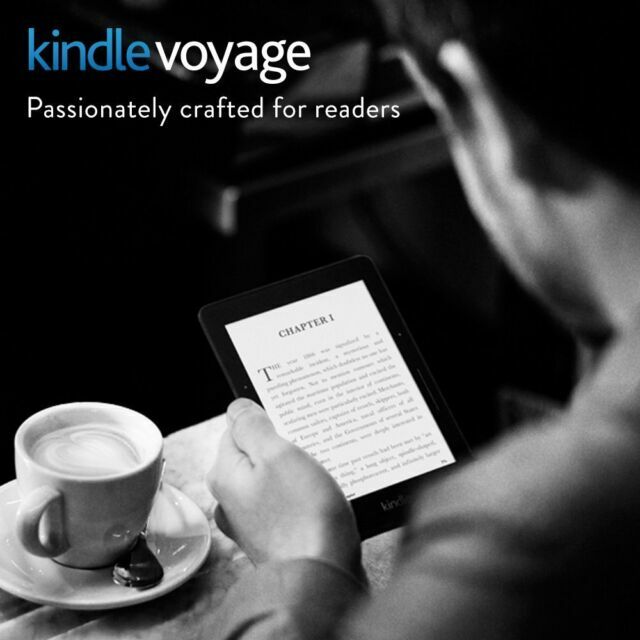 The Amazon Kindle Voyage offers various features to keep you gripped to your favourite read. It provides clear visuals on its 6-inch display for an unhindered reading experience. You can browse the Internet seamlessly and download eBooks within seconds as it offers Wi-Fi connectivity. With a 4 GB internal memory, this Amazon eBook reader makes storing data easy. In addition, this model weighs 0.18 kg and is available in black. Good . . . But . .
A decent upgrade from my original very early Kindle but the bezel page turn touch zones are temperamental, sometimes turning back three pages, and I would have preferred the original buttons. Also, the slight ‘cheese wedge’ shape means the cover / case does not fold back flat. I can’t find the right balance of font type and size, but that is a personal preference rather than a fault. This is my first e-reader and i couldn't decide for long time if it's worth it over books and which one. The price was expensive for me at the time and I watched reviews of different readers and went with the voyage and second hand on ebay. I am truly surprised every time I use it (almost every day), the ease of reading, the different lighting options, battery life is very long (weeks of 1 charge), translation, Wikipedia, shows how long is left based on your pace etc. There are countless options to adjust it exactly for each person, it's absolutely wonderful machine, I truly admire amazon for creating such a helpful gadget. Besides if you never used one rest assured that the ink is as good if not a lot better and sharper than a book.